Wait until you have a full load before using your automatic dishwasher. Savings: 33 gallons. Don't let the faucet run while cleaning vegetables. Instead, rinse them in a sink or bowl filled with clean water. Savings: 3 gallons per minute. Steam, rather than boil your vegetables whenever possible. Use a tight lid on the pot, and as little water as possible. Savings: up to 5 gallons, depending on pot size. Thaw frozen foods ahead of time, not under running water. Savings: 3 gallons per minute. 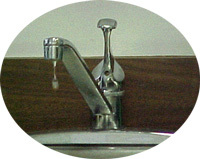 Check faucets and pipes for leaks (including automatic ice makers and dishwasher hoses). Savings: 8,640 gallons per month for 1/5 gallon per minute leak. Keep a container of drinking water in the refrigerator. Remember; running the tap to cool water for drinking loses 3 gallons per minute. Savings: 3 gallons per minute. When washing dishes by hand, rinse them first in a sink filled with water, rather than under a running tap. Savings: 3 gallons per minute. Don't overuse garbage disposals. Use the disposal only at the end of cooking or cleanup periods, or when full. Savings: 3 gallons per minute. Restaurants and other food establishments should serve water only upon request. This saves on drinking water plus the water needed to wash glasses. Savings: many thousands of gallons for serving and cleaning.